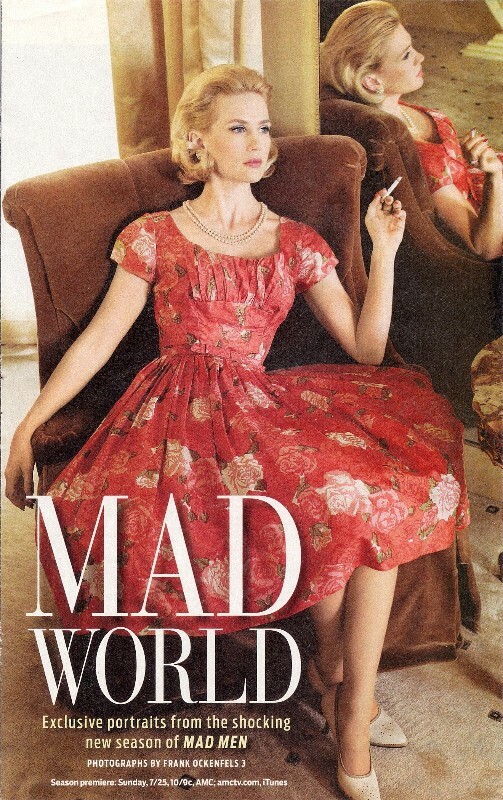 A couple of summers ago I saw this photo in "TV Guide" I fell instantly in love with this dress. I ripped the insert out of the magazine and went fabric shopping. Of course I would have loved to have found this exact print in a crisp silk, scaled perfectly for Gene and her friends, but dream on! After searching all the fabric stores in the Puget Sound area that I could get to, I found this print at a quilt shop. I thought it was a pretty good match to the original dress. "Blue Parasol" Gene is my favorite Betty model. I loved this design so much I made it in two other fabrics. I decided to try this dress on one of my Poppy Parker dolls, I was very pleased how well it fit her. It also goes well with her era, since Mad Men takes place in the early 60's. She just needs some red lips now. This version of the dress is sold out. My re-styled "Glammed Up" Ivy looks lovely in this version. While I was sewing these dresses the print kept reminding me of food. I couldn't figure out why. Then I dawned on me, red jello mixed with cool-whip! I love my "Tornado" Gene with red lips. I have a few of these dresses for sale in two of the different fabrics. If you are interested in buying one of these dresses click here. Beautiful!! You are truly Talented Diane.